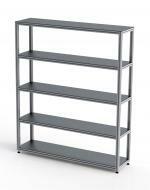 Our shelving units are easy to build, easy to clean and will last a lifetime! 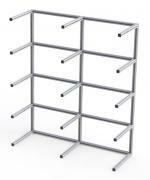 Due to the inherant benefits of our aluminum extrusion, custom shelving is simple to design and easily expanded upon. Whether you need surfaces to stock items in a warehouse, or a part drying rack, we can help design a shelving unit specific to your needs. 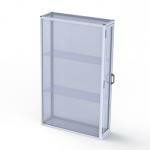 The T-slots assist in various mounting positions as well as provide a channel to hide unsightly cables for lighting. 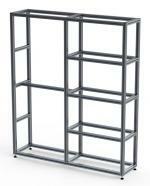 Shelf material, powder coat options, and accessories are dependant on your personal needs and taste. Do you have your own shelf design, or need help creating a custom design? Contact us today to speak with our team!